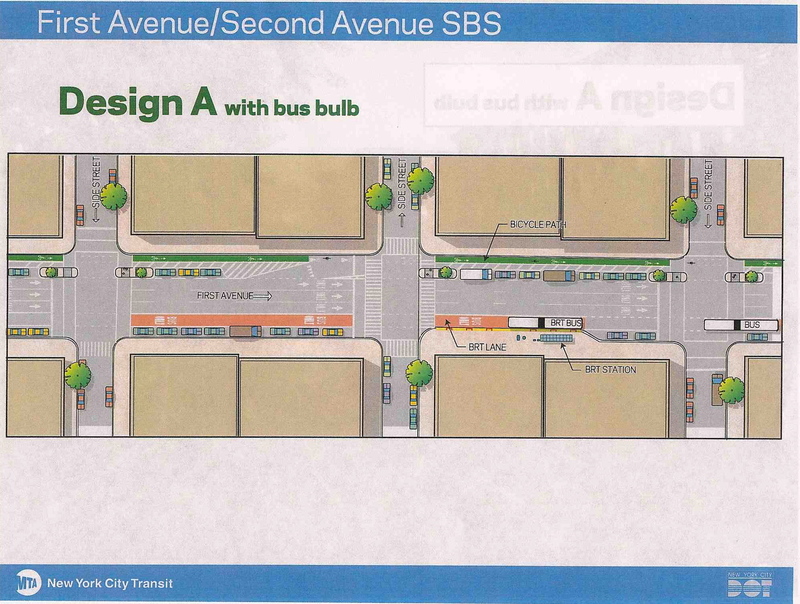 Last night, the New York City Department of Transportation presented detailed plans for the upcoming implementation of Select Bus Service (SBS) on 1st and 2nd Avenues at the third meeting of the Community Advisory Committee (CAC). The CAC consists of various community stakeholders members from the districts along the SBS corridor. Also in attendance last night were a few East Side elected officials (CM Dan Garodnick, State Senator Liz Krueger) as well as a few reporters from the various beats around the City (Streetsblog, WYNC, and Our Town). DOT first ran through a quick update of the issues with locating SBS stations along the route. Certain trees and street furniture may needed to be removed and replaced in other locations in order to make room for the new stations and accompanying infrastructure. 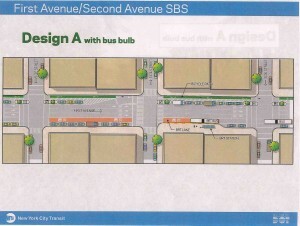 DOT then detailed exactly how the street-scape would be reconfigured for SBS. 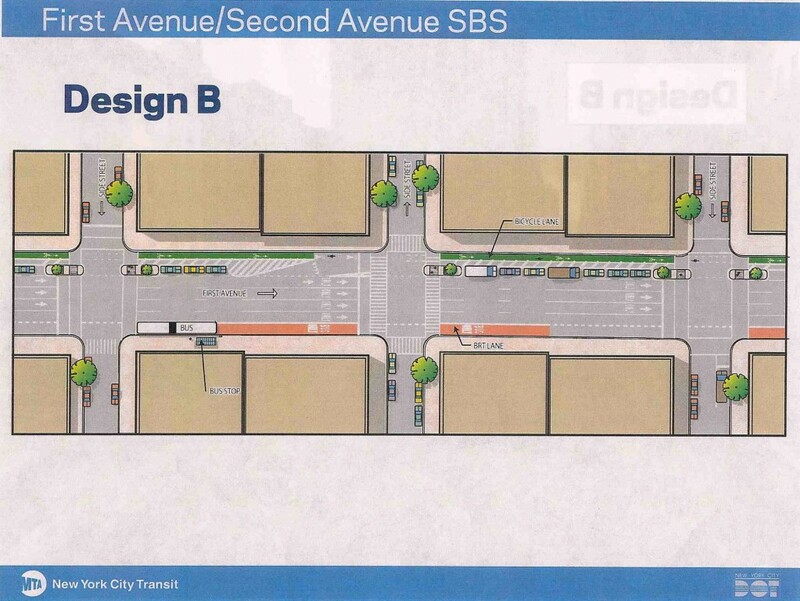 The City does not plan to install a physically separated bus-lane (i.e. one with some sort of barrier to keep other vehicles out) as is found in other cities such as Bogota, Colombia. The City will instead utilize 3 design variations throughout the SBS corridor in order to: (1) improve bus service, pedestrian safety, and bicycle access; (2) maintain traffic flow; (3) allow curb access for delivers and drop-offs; and (4) provide metered parking. 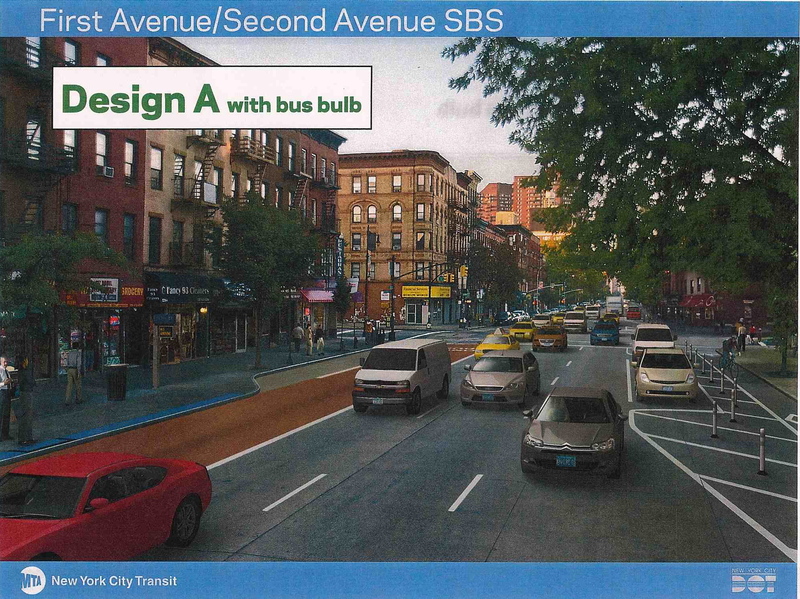 Design A would include an off-set bus lane with a lane for metered parking at the curb along the right side of the avenue, 3 lanes of through traffic, another metered parking lane, and then a protected bike lane along the left curb. 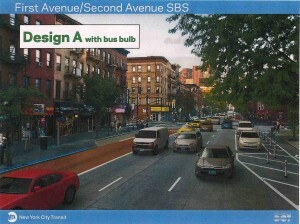 DOT would later add bus bulbs (as seen currently on Lower Broadway) at SBS station locations. Pedestrian crossing islands would also be installed along the left sides of the avenues, in front of the parking lanes, to close the distance people must currently navigate to cross the wide Avenues. Design B would not include an off-set bus lane but would instead keep the bus lane along the right curb, similar to what’s in place (yet rarely enforced) now. Four lanes of through traffic would be maintained with a parking lane and protected bike lane along the left curb. Bus lane regulations may* allow for midday and off-peak (non-rush hour) usage of the curb-side bus lane for delivery trucks and metered parking (*more details are currently needed on this point). Again, pedestrian crossing islands would also be installed in this design. 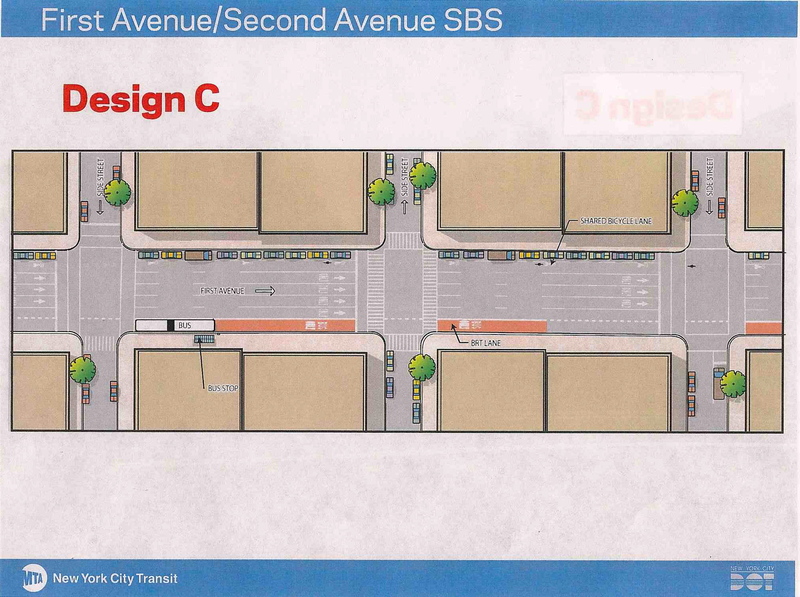 Design C, (the least optimal) would basically keep the status quo with a curb-side bus lane, 4 lanes of through traffic, a “shared” or Class 3 bike lane, and then a parking lane along the left curb. A Class 3 bicycle lane contains signal markings on the pavement to alert drivers that bicyclists may use the lane but does not include any form of physical protection (as in the other 2 designs). Bus lane regulations would be similar to that in Design B in order to accommodate off-peak deliveries and metered parking. The DOT has not finalized exactly where each design variation will be implemented along the SBS corridor. The map provided at the meeting shows that design variations A and B will be utilized along a majority of the route. 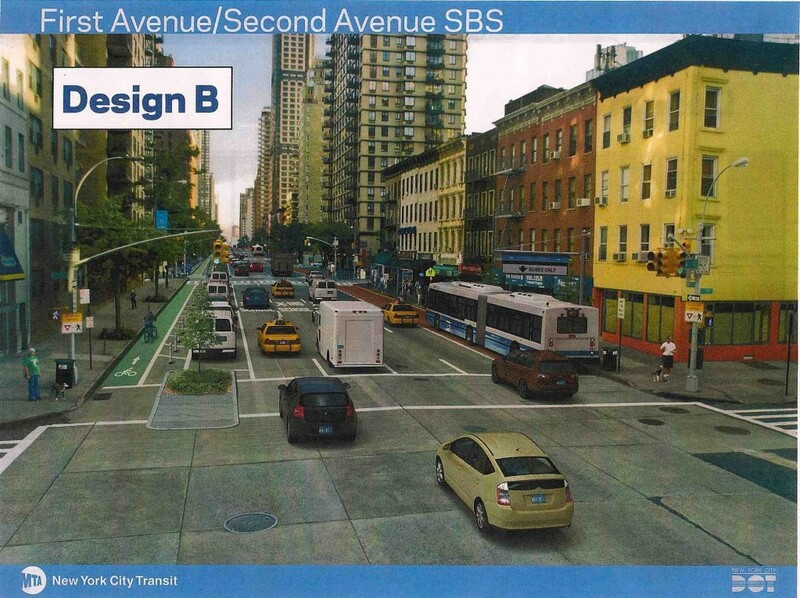 No changes are intended to the existing street-scape in the area of Second Avenue Subway until construction has been completed. 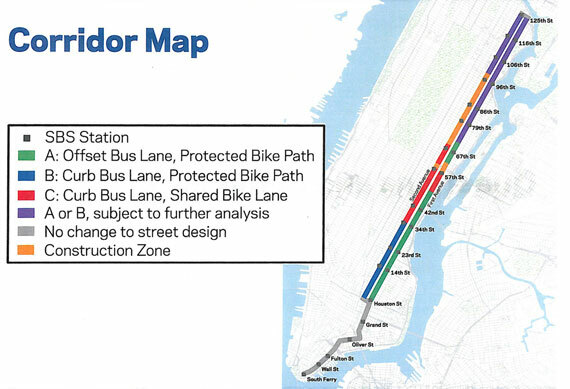 Also of note is that Design C will be implemented in the area covered by the current East River Greenway gap detours. First and foremost NYC DOT must be commended for planning to implement such a far-reaching and innovative redesign of the City streets to accommodate all-users of the road and prioritize bus transportation. Though the current designs cannot be characterized as “word-class,” they are a significant improvement over the current configuration. The designs will speed up buses while providing much-needed protected bicycle infrastructure to the growing number of East Side cyclists, improving the pedestrian experience, and maintaining vehicle traffic flow. The City is also missing a vital (and extremely rare) opportunity to include desperately needed protected bicycle lane infrastructure along the corridor section that overlaps the current on-street detour of the East River Greenway. Because of the large gap in the Greenway from East 37th Street to East 60th Street, cyclists are forced to detour onto some of the most highly trafficked dangerous parts of 1st and 2nd Avenue in East Midtown. Cyclists must contend with bridge and tunnel traffic while fighting for space on the extremely fast-moving avenues. These developments confirm that the City, State, and local stake-holders must continuously work towards closing the Greenway gap and improving the East River Greenway to provide a truly protected bicycle route around some of the City’s worst streets. 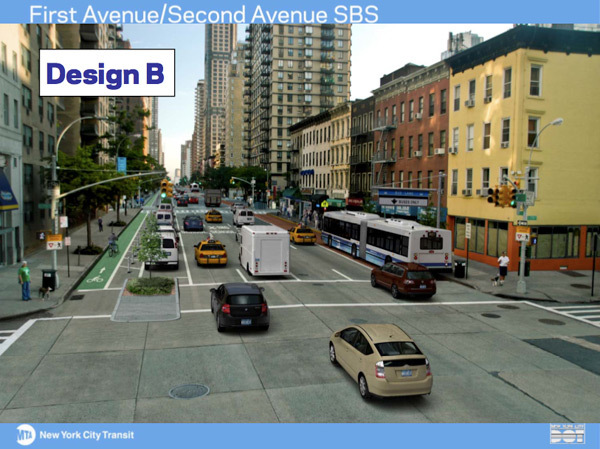 The City’s designs for SBS are no doubt better than what is currently in place. These plans will continually evolve as the SBS roll-out makes its way through the various community boards. In any event, this we know is true: much-needed bike and bus improvements are indeed coming to the East Side. Well this is a disappointment and a failure of vision. No Bogota-style protected bus lane? Pointless. 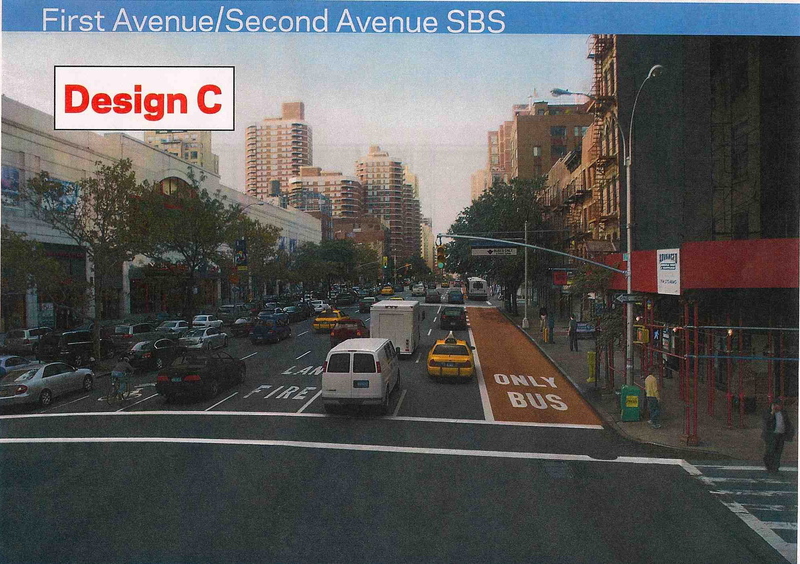 If the current unprotected curb-side bus lane doesn’t work, what make DOT or MTA think that a future unprotected curb-side bus lane is going to work? 19 elected officials wrote a letter asking for protected bus lanes. It seems pretty simple to me. HUGE disappointment and missed opportunity. Will the buses be able to control the traffic lights to have priority? That seems like an important piece. Sharrows through midtown? Is this a joke? That’s precisely where a protected bike lane is most essential. We totally agree and Upper Green Side will be working together with our advocacy partners on improving this design. Making room for cars in midtown only encourages more traffic. As we have seen in the Broadway corridor, DOT can make streets safer by taking away a lanes for automobiles and adding protected bike lanes and more sidewalk space. I hope these bike lanes will not be used as an excuse to do nothing to close the gap from 38-60 (37-60 on street). Bike lanes interrupted every block by cross streets and lights are no substitute for a direct, uninterrupted bike highway (Greenway) along the river. Also, a single lane bike lane on First and Second will, at least in the warm part of the year, quickly get overwhelmed with suddenly liberated bikers who are no longer afraid for their lives while riding on the heretofore unmarked east side.